WEDNESDAY OCT 17 Call them undermanned, and potentially over matched. You could deem them underdogs as the #1 seed, even while playing on their own home field. You could term them inexperienced as they fielded a line-up more than half of which did not start a game during the 2018 season. You could describe them as having an uphill climb as their leading scorer was flanked by three defenders every place he went on the field. But, after 90 of the most technically sound minutes of soccer they have played all season, by the time the sun set on Wednesday afternoon, the Westchester Community College Men’s Soccer team could only be described with one title. With 10 players – including six starters – forced to watch the game from the stands, the top-seeded Vikings took the field for the first-ever Mid-Hudson Conference Championship Game against second-seeded Ulster Community College on a frigid Wednesday afternoon with more than a share of question marks after being forced to compete under the most adverse of circumstances. But, in one of their most dominant efforts of the season, the question marks became answers, and later exclamation points as Westchester pounded the Senators, 4-1. With the win, the Vikings captured their fourth consecutive Mid-Hudson Conference Championship, and first for Head Coach Alfio Carrabotta. Viking forward Franco Ladron De Guevarra (White Plains, NY/White Plains HS) spent the 2018 regular season establishing himself as one of the best strikers in Region XV, and on Wednesday afternoon removed any doubt as if he earned such accolades. Despite being denied the ball, shadowed by as many as three defenders, and double-and-triple teamed each time the ball was near his feed, Ladron De Guevarra was simply brilliant on Wednesday. The sophomore netted his second hat trick of the season, and easily could have scored more. He fired 12 shots during the game, and was undoubtedly the best player on the field. After a quiet beginning to the game, a Renzo Tolentino (New Rochelle, NY/San Antonio-Peru) goal at 4:21 off a Chris Vallejo (Pleasantville, NY/Pleasantville HS) assist loosed everything up for the Vikings as the Ulster quickly learned that WCC had weapons beyond Ladron De Guevarra. With a little bit more space, the crafty righty took over, scoring unassisted on a direct kick at 26:38 to make it 2-0. Ulster seemed to turn things around at 31:50, making it a 2-1 game after a spectacular individual effort by Kelvin Nunez. But, from there, the Viking defense did as they have done all season long. They shut the door, and did not allow a second goal for the 12th time in 14 games. Despite playing into the wind during the final 45 minutes, Westchester increased their dominance as Ladron De Guevarra scored off of assists by Miguel Perez (Montrose, NY/Hendrick Hudson HS) at 77:53 and 89:59 to clinch the championship. How dominant were the Vikings? Playing with only one substitute, Westchester nevertheless controlled possession from start-to-finish, and ended the game with a 28-4 edge in shots. The Vikings also doubled the corner kick edge, 6-3. Freshman goalkeeper Guilherme Griza (Novo Hamburgo-RS (Brazil) Colegio Marista Pio XII) called upon to face two shots on goal during the game, saving half of them. SATURDAY OCT. 20 Westchester won the skill competition 4-3 to advance to Wednesday’s Regional Final Four where they will travel to face top-seeded Nassau Community College at a time to be determined. The Vikings improve to 11-3-1 for the season under first-year Head Coach Alfio Carrabotta. And as usual for WCC, it took every ounce of emotional strength to get there. Two weeks after dropping a 2-1 heartbreaker to the Panthers, Westchester could not have scripted the start to the Quarterfinal round any better than they did on Saturday. The Vikings got on the board during the opening minute when Luis Galeano (Mamaroneck, NY/Rye Neck HS) found sophomore Miguel Perez (Montrose, NY/Hendrick Hudson HS) for a bang-bang goal that gave WCC a 1-0 lead. From there, the teams traded chances throughout the game, but the stout Viking defense was able to bend without breaking time after time through the remainder of the first half, and much of the second half as well. It was not until just under 10 minutes remained in regulation when BMCC finally found the back of the net to the score 1-1, and the game headed into overtime. As has been the case all season, Westchester’s defense held strong throughout the overtime periods. For the 13th time this year, the Vikings did not allow a second goal in a game. However, neither did BMCC, and the game headed into penalty kicks. During penalty kicks, Franco Ladron De Guevarra (White Plains, NY/White Plains HS) nailed his shot. Leonardo Vargas (New Rochelle, NY/New Rochelle HS) scored. Jose Tovar (Yonkers, NY/Riverside HS) did not miss. And after a BMCC miss, Galeano’s goal proved to be the winner for WCC, igniting a wild celebration on the field. For the Vikings, freshman Guilherme Griza (Novo Hamburgo-RS (Brazil)/Colegio Marista Pio XII) made eight saves, including two huge overtime saves to allow the Vikings the chance to notch the victory. Overall, BMCC out-shot Westchester 23-14, and had a 7-3 edge in corner kicks. TUESDAY OCTOBER 16 For anybody thinking that next week’s Mid-Hudson Conference Volleyball Championships would be another fight to the finish between Rockland Community College and Orange Community College, those plans may in fact be on hold. 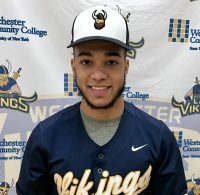 In front of a raucous Viking Gymnasium on Tuesday night, Westchester Community College pulled off the upset of the season, and their biggest win in years, sweeping Rockland CC – the 2017 Mid-Hudson Conference Champion – 3-0. With the win, WCC improves to 12-7 overall, 6-3 in the Mid-Hudson Conference, and 12-6 in Region XV competition. Westchester won the match with scores of 25-15, 25-19, and 25-22. 48 hours before sophomore night at Westchester Community College, it was the four WCC sophomores to lead the Vikings to the biggest win of their WCC careers. Taylor Mello (Cortlandt Manor, NY/Putnam Valley HS) registered her second double double of the season with 11 kills, and 10 digs, to go with seven service aces on a night when the WCC service game proved to be an enormous difference. Also for Westchester, fellow sophomore Madison Young(Greenburgh, NY/Woodlands HS) broke the 20-kill mark for the third time this season, notching 20 kills, five blocks, five digs, and four service aces. Westchester CC also had key contributions from Lindsay Leggio (Mahopac, NY/Mahopac HS) and Alysha Owens(Mount Vernon, NY/Mount Vernon HS). Leggio registered a match-high 25 assists to go with eight digs, while Owens turned in perhaps her finest performance of the season with 15 kills, 7 digs, 4 service aces, and 2 blocks. THURSDAY OCTOBER 18 The Ulster Community College Women’s Volleyball team thought they had the final set of Thursday night’s match at Westchester Community College won. Up 23-16, and with all of the momentum in the world, it appeared as if the visiting Senators had completely turned the tide and would suddenly be right back in a match that they trailed 2-0. Unfortunately, for Ulster, they still had Taylor Mello (Cortlandt Manor, NY/Putnam Valley HS) to contend with … which means they really didn’t have a shot. The sophomore , playing her final home match in front of a raucous crowd at Viking Gymnasium, used her booming serve to help capture nine eight consecutive points. Shortly after Ulster tied the match at 24, the Vikings rallied once again, winning the final set 26-24, the match 3-0, and igniting a wild celebration on the court after the comeback was complete. Speaking of comebacks, there may not be one in the entire NJCAA better than what Westchester Community College embarked on during the 2018 season. After a 7-13 finish one year ago, WCC completely reversed course, and with the win finished the 2018 season with an incredible 13-7 ledger. The win also earns the Vikings a #2 seed for Tuesday night’s Mid-Hudson Conference Championships when Westchester will face Rockland Community College, who the Vikings swept two days ago. Westchester has also clinched a spot in the upcoming NJCAA Region XV Championships after not qualifying one season ago. The seeding, opponent, and location for the Region XV playoffs will be determined after this weekend’s action. Westchester won the match, 25-10, 25-20, 26-24 to finish the 2018 season with a 5-1 record at home. Prior to the match, Mello and four other sophomores honored for their contributions to the program, Athletic Department, and community and all played a huge part in the sweep. Madison Young (Hartsdale, NY/Woodlands HS) led WCC with 11 kills and added five blocks. Lindsay Leggio (Mahopac, NY/Mahopac HS) chipped in 22 assists. Mello had 11 digs to go with six kills, and Alysha Owens (Mount Vernon, NY/Mount Vernon HS) chipped in nine kills. Also for Westchester, Gwynneth Gumbs (North Salem, NY/North Salem HS) enjoyed a fine night overall, giving the Vikings several huge plays. SATURDAY OCTOBER 20 (Stone Ridge, NY) – Freshman Randy Culcay (Ossining, NY/Ossining HS) earned a third place finish (35:43) as four Vikings finished in the top-10 as the Westchester Community College Men’s Cross Country team captured the 2018 Mid-Hudson Conference Championship on Saturday, Oct. 20 at Ulster Community College. The win was Westchester’s second championship since the 2016 season, and first for Head Coach Meron Simon. Freshman Mark Naulaguari (White Plains, NY/Woodlands HS) finished in eighth place with a 37:56 time, freshman Bolaji Akinbowale completed the 8K course in 45:02 to finish in ninth place, while freshman Max Stock rounded out the top-10 in a time of 45:03. By virtue of earning top-seven, finishes at the Conference Championship, Culcay, Naulaguari, Bolaji, and Stock all earned First-Team All-Conference honors. Yaminah Calinda (Lincoln High School) finished seventh in the women’s race with a time of 37:01. Calinda earned a spot on the All Mid-Hudson Conference team.